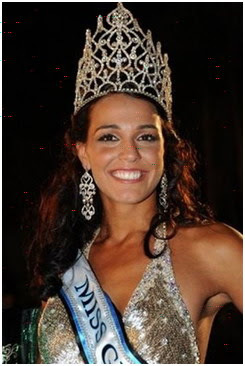 Miss Gibraltar Kaiane Aldorino became the winner of Miss World 2009 contest that held at December, 12. She is 22 year old and work as HR Clerk. Aldorino said she "had no words" to describe how she felt about her win, but that she was "really happy”. She was crowned by the former Miss World from Russia, Ksenia Sukhanova. Meanwhile, Bollywood actress and former Miss World Priyanka Chopra handed over the Miss World 2009 sash to Miss Gibraltar. Miss World 2009 pageant final was held on Gallagher Convention Centre, Johannesburg, South Africa. 112 Beautiful girls from many countries were participated on this 59th Miss World Contest. The firs runner up was Miss Mexico, Perla Beltran Acosta. Meanwhile, Miss South Africa, Tatum Keshwar was the second runner up. The next Miss World 2010 will take place in Vietnam.